Sometimes 4 decks are just not enough. 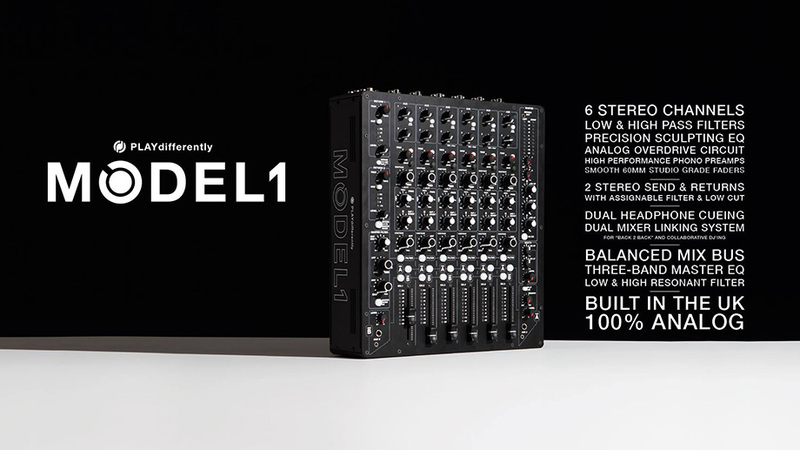 MODEL 1 delivers 6 stereo channels and endless mixing capabilities which give you a new layer of control over each element in your mixes. SCULPT is a semi-parametric swept bell filter, and consist of two controls,FREQ which sets the centre frequency and CUT/BOOST which adjust the gain or a attenuation at this frequency. Smooth intuitive controls matched with warm pure analogue circuitry. Built in the UK with partners DigiCo and Allen & Heath using alloy/steel chassis for maximum strength and minimum weight optimised for touring, club and performance situations. 2 stereo sends + returns: each with an assignable filter and low cut, they also can be assigned to the mixer filter. Drive Control: Every input on the mixer has a Drive knob, which allows you to adjust “the level at which the channel pre-amplifier clips the input signal, thus creating harmonic distortion as an effect”. 14.49"" x 12.6"" x 4.09""; 11.9 lbs.